Lag, the prehistoric wabbit, cart-wheeled with ease to a strange wall. "What's a wall doing here?" whispered the Wabbit to Lapinette. "It's the Star Wall where things come and go," said Lag. "What sort of things?" asked the Wabbit. "Interestingly interesting things" replied Lag. Lapinette looked at the Wabbit and the Wabbit shrugged. "Thanks to you, we'll develop the cart-wheeling gene," said Lag. "Gene?" said the Wabbit with surprise. "Because of you, wabbits will be able to cartwheel in the time that has yet to come," said Lag. 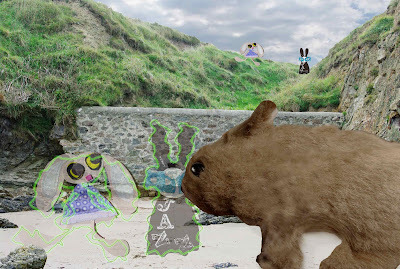 "Well, it's really only me that cartwheels," murmured the Wabbit and he thought for a bit. "So I came back and made the wabbit cartwheel a possibility?" he mused and his voice trailed off into silence. "So it's a paradox," said the Wabbit suddenly. "Maybe not" said Lapinette. "It could be a temporal modification negation." "Is that the principle that makes everything that happens OK?" asked the Wabbit. "Automatically," replied Lapinette. "That’ll do," said the Wabbit. "Hold quite still and you'll find yourself reassembled at the place you came from," said Lag. "Reassembled?" said the Wabbit and he felt his body begin to tingle. As he watched, Lapinette faded and disappeared before his eyes, leaving a trail of sparkles. "Oh, goodbye Lag," said the Wabbit kindly. "Goodbye Wabbit, we're going to practice and practice," said Lag. "No rush," said the Wabbit and he vanished.